As the Lenten season moves on, you may be on the lookout for some new places to try that are offering up some really good seafood (or vegetarian meals). Well, look no further. 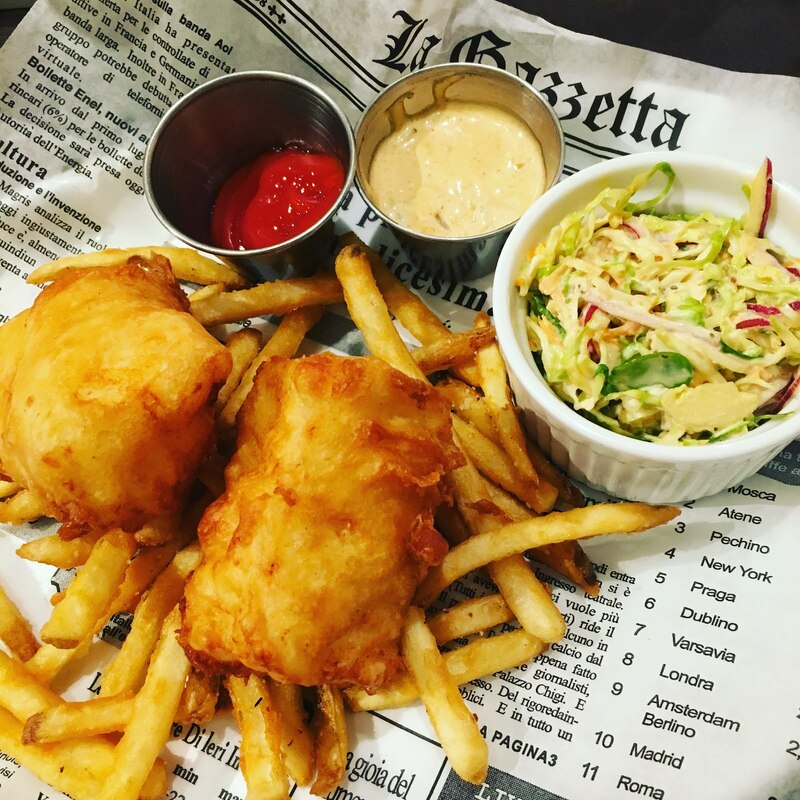 Here is Chicago Foodie Sisters' guide to some of the top spots to enjoy seafood during the final weeks of Lent. Every Friday this Lenten season, La Voute will feature a variety of seafood specials ranging from Crab Cakes to Mussles to Salmon and so much more. And during Lent and beyond you can enjoy crab legs every Wednesday. Chicagoans can enjoy an extensive meat-free menu this Lenten season, including a variety of sashimi, nigiri, and maki fare. Highlights also include Hokkaido Miso Ramen with vegan kimchi, Japanese mushrooms, fried tofu, and negi ($14) and Kankoku-Nabe ($16). Reservations are available seven days a week via Reserve. The sophisticated, French-Riviera inspired restaurant in the Gold Coast offers seafood options in an elegant setting for diners observing Lent. With a menu showcasing fresh, Mediterranean-style ingredients, guests of FIG & OLIVE enjoy Sea Scallops with honey roasted carrot, orange segment, citrus and charmoula ($19); Salmon Crudo with pomegranate, grapefruit segment, pink peppercorn and pomegranate dressing ($16); Crab Cake with horseradish, preserved lemon mayo and cilantro ($16); Riviera Salmonwith braised endive, baby kale, cauliflower purée, olive and piquillo condiment ($26); Branzino a la Plancha with haricot vert, yellow wax beans, roasted potato and green harissa sauce ($32), and more. For more information, please visit FIG & OLIVE’s website or call (312) 445-0060. Leave traditional notions of pot pie at the door, because this Lenten season Executive Chef Scott Shulman is serving up something special at Homestead on the Roof. Putting his own unique spin on the classic comfort food item, behold the Lobster Pot Pie. A homemade pie shell created in-house by Executive Pastry Chef Chris Teixeira, this signature item is filled with decadent Maine lobster, seasonal vegetables, and lobster bisque. Hello, Lent. For more information, please visit Homestead on the Roof’s website or call (773) 332-2354. I made my first visit there recently after being urged to go there form friends for several years. There's a significant number of seafood entrees on the menu as well as seafood specials. I enjoyed some salmon with a lemon caper sauce that was amazing. My lunch portion came with soup or salad for just $14. The meat-free options are limitless at Latinicity. The foodhall is home to ten unique kitchens, including Mariscos, Spanish for “seafood”, where diners can enjoy calamari, mussels, fish & chips and oysters. Latinicity also serves up classic ceviches, salads and tortas, with Lent-friendly options to go around. Reserve a table at Pata Negra, the full-service tapas restaurant within the foodhall, to enjoy small bites like gambas al ajillo (garlic shrimp), pulpo de la gallega (octopus), or montadito de congreja (crab toast). Known for its bold Indian-Latin cuisine, the fusion restaurant offers an array of seafood and vegetarian options. Appetizers include Toasted Coconut Shrimpwith kashmiri mirch chimichurri and lychee jalapeno salsa, Blue Corn Crusted Scallops with Peruvian corn, calabasa, chipotle and goat cheese, and Grilled Peruvian Pulpo Octopus, featuring tangy tiradito sauce and jicama slaw. Signature Latin entrees include Vermilion’s Caldeirada De Peixe, a savory Brazilian seafood stew served with tomato rice, and Plantain Crusted Seasonal Whitefish, seasoned with cilantro mint and served with roasted corn tomatillo salsa. Another staple is the Lobster Portuguese, voted as a top dish worldwide by USA Today. Reservations can be made on OpenTable or by calling (312) 557-4060. 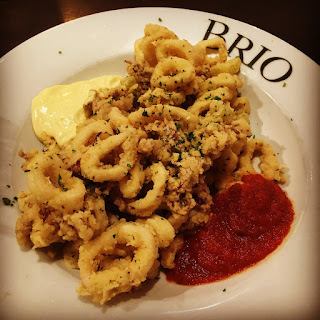 They say variety is the spice of life, and BRIO Tuscan Grille Lombard in Chicago is embracing this philosophy with an array of new dishes on the “A Variety of Flavors” lunch and dinner menus. Available Tuesday, Feb. 28–Saturday, April 15, the menus present two exciting new appetizers, three entrées (including two mouthwatering seafood dishes), a divine dessert, and delightful wine options. I was in recently to try out some of the menu items from this list of limited-time selections. The calamari was fantastic and the Peroni Beer-Battered Fish & Chips hit the spot. 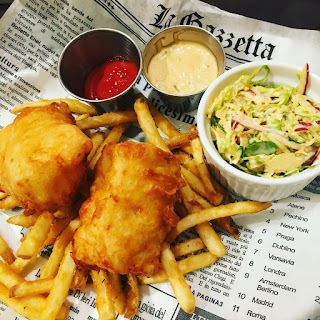 The North Atlantic cod was crispy on the outside, succulent and so flavorful on the inside. It came with fries and Brussels sprout slaw for $17.95. The pasta dishes are always pretty awesome and this menu includes a Lobster and Black Pepper Shrimp Ravioli. The Florentine located in the Loop inside the JW Marriott is one of my absolute favorite dining spots in the city. Venture in for seafood appetizers and entrée options crafted by Executive Chef Zach Walrath. The Italian dining destination offers an elegant, seasonal menu with dish highlights including Capesante: hudson canyon scallops, parsnip puree, red cabbage, gala apple, pancetta ($20); Branzino:whole mediterranean sea bass, giant white beans, puttanesca, basil, lemon ($42); Salmone: faroe island salmon, shaved fennel, orange, grapefruit, treviso, pomegranate agrodolce ($32); Trota: pan roasted trout, creamed escarole, fingerling potatoes, smoked trout, capers ($35). For Lent-friendly imbibing, tasty mocktail selections include Mixed Berry Italian Cream Soda with farmers market mixed berry simple syrup, sparkling water, topped with cream; A rif on a Caipirinha with muddled lime, jalapeno, cucumber, agave nectar and topped with soda; and Pomegranate & Mint Mojito: the classic without the liquor. For more information, please visit The Florentine’s website or call (312) 660-8866.